Due to staffing limitations we recommend calling prior to planning a visit; unexpected events occasionally result in an unplanned closing. We can accept cash or checks, but cannot process credit/debit cards. Spiro Mounds Archaeological Center preserves 150 acres of the site along the Arkansas River. The center offers interpretive exhibits, an introductory slide program and a small gift shop. There are nearly two miles of interpreted trails, including a one-half mile nature trail. An archaeologist is on staff to answer questions and lead tours. Schools and large groups can arrange for guided tours of the site by contacting the staff by phone or email at least a week ahead of time. Special tours of the site, available to everyone, are offered during the solstices and equinoxes. Spiro Mounds Archaeological Center features an annual Family Kite Flite Day on the third Saturday of March, Archaeology Day, and Birthday Bash in May, and periodic temporary exhibits sponsored by the Spiro Mounds Development Association. Spiro Mounds Archaeological Center is located northeast of Spiro, Oklahoma, four miles north of US-271. The site is closed for state holidays. 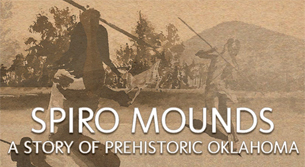 Visit the The Encyclopedia of Oklahoma History and Culture to learn more about Spiro Mounds. May 11, 9 a.m.–5 p.m. The mounds site, located seven miles outside of Spiro, Oklahoma, is the only prehistoric, American Indian archaeological site in Oklahoma open to the public. The mounds are one of the most important American Indian sites in the nation. The prehistoric Spiro people created a sophisticated culture which influenced the entire Southeast. Artifacts indicate an extensive trade network, a highly-developed religious center, and a political system which controlled the entire region. Located on a bend of the Arkansas River, the site was a natural gateway from which the Spiro people exerted their influence. Much of the Spiro culture is still a mystery, as well as the reasons for the decline and abandonment of the site. Today, the Spiro Mounds site and artifacts are among Oklahoma's richest cultural resources. The protected site included 150 acres of land that encompass twelve mounds, the elite village area and part of the support city. Although various groups of people camped on or near the Spiro area over the previous 8,000 years, the location did not become a permanent settlement until AD 800 and was used until about AD 1450. During this period, known as the Mississippian period, Spiro leaders were developing political, religious, and economic ties with people from the Gulf of California to the Gulf of Mexico and from the coast of Virginia to the Great Lakes. They shared horticulture, elaborate ceremonies, mound building, and an iconographic writing system with more than sixty different tribes. From AD 900 to 1300, the leaders at Spiro Mounds thrived. The mound center declined and was eventually abandoned by AD 1450, although the city continued to be occupied for another 150 years. The people of the Spiro Mounds are believed to have been Caddoan speakers, like the modern Wichita, Kichai, Caddo, Pawnee, and Arikara. The site remained unoccupied from AD 1600 until 1832. While Choctaw and Choctaw Freedmen cleared the mound site for farming late in the 1800s, they did not allow any major disturbance of the site until the Great Depression. During the 1930s commercial, and later academic, excavations revealed one of the greatest collections of artistic and utilitarian prehistoric American Indian artifacts in the United States. Early looting of the site led to new laws, making Oklahoma one the first states to preserve and scientifically research archaeological sites. Spiro Mounds Archaeological Center opened to the public on May 9, 1978. Today the site is owned and operated by the Oklahoma Historical Society. In issue 8 of Crossroads we visited Spiro Mounds to explore this unique archaeological site.